The Antelabbit has a relatively unknown history but many suspect it to have come from the Fifth Void Invasion. A creature known as “Cӧnne’jo Quellé-ӧssome Tӧlo’queṋna-puénne” in Imperial Elven chronicles of the Invasion match the Antelabbit well, being named as deceptively small and all-consuming and supposedly serving as a scouting, forward force of the enemy. However, detailed reports of the animal begin only after the Cataclysm where several Velheim towns in Ellador’s west were found empty of all life, with doors and barricades eaten through. While originally suspected to be raiders, the traders who had discovered the curious sight soon came across several Antelabbit. They were then able to fight off this small group and escaped back south to tell their tales of demonic rabbits. In the years since this famous encounter, the Antelabbit has been left alone with the only ones to pursue it being well-paid hunters, radical scholars or collectors of exotics. The animal’s population has remained low over that time, namely due to their cannibal nature and it is rare now for a settlement to be attacked by them. With the recent moves made in Ellador by the Isldar and the Great Ice Dragon, some wonder if the Antelabbit will survive for much longer against such foes. But those who have faced them know: Never underestimate that little fluffy exterior. The Antelabbit sits at a foot and a half long and is one foot tall when on all fours. Its head is small but displays many of the features of a rabbit such as large and flexible pointed ears, wide black eyes, little noses and small mouths. However, an Antellabit’s mouth is full of pointed teeth rather than the bucked or smaller teeth of normal rabbits. While the mouth can stay small, the animal can unhinge its jaw to take larger bites. The remainder of their bodies are also similar to rabbits, with a short neck connecting the head to the body, two small forward paws and two larger rear paws supporting a round, somewhat fat body with a short tail. There is another hidden feature as well; the rear paws of the animal hold a single large claw each, able to latch onto prey or allow them to perch. Their rear legs are also deceptively small compared to the raw jumping power they give the Antellabit. The animal is covered in a coat of thick fur that varies in color depending on the season, some of which forms a light collar around the animal’s short neck. Antelabbits have no obvious external sexual dimorphism and would possess equal numbers of both genders except for them eating each other each spring. Instead, their diversity comes in their coloration. In the spring and summer months they are various shades of brown while in autumn they are colored black, but by winter they turn solid white..
Antelabbits are born like normal rabbits, from their mothers in clusters of one to six “kittens.” They rapidly mature, reaching full size within a quarter of a year and by the end of autumn, primarily to defend themselves from other members of their species who wish to eat them. Even their own mother will eat them if it is needed for their survival. When the mating season comes, late spring to early summer, males randomly pair with females. There is no direct competition, no fighting for a mate; it is just carried out when and where possible. The Antelabbit can live for up to ten years. No one can understand the mind of an Antelabbit, though their most base instincts are clear for any to see. The Antelabbit is a predator who relies on surprise and ferocity to kill its prey. Aided by its strong, sharp teeth, it can chew through most substances, even metals like Copper and Ferr-Iron if given enough time. Their common tactic is to jump for a victim’s neck, latching on to their chest with the “hooks” and rapidly biting at the target’s neck. They are also known for eating other members of their own species when fresh meat and carrion are insufficient. At all other times, the different members of the species seem to get along amicably and share what they have in the way of shelter and food, especially if it is a large kill. Antelabbits are divided into swarms, of which there are three known to exist in the west. They move around every few years just before the mating season to ensure the different areas recover their animal populations. No swarm has ever met another, but most dread the day such an occurrence transpires. They live in underground dens, believed to have been dug centuries ago, and each swarm uses the dens of the others. 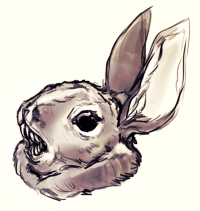 The ears and feet of Antelabbits are considered by many Url to be important symbols of the hunt and a testament of an Url’s skill, for obvious reasons. There is a myth told to children in the northern regions of the Regalian Archipelago of three powerful knights who all came upon an Antelabbit in a forest. One tried to remove the animal gently and was eaten. The second tried to trick the animal and was eaten. The third ran it through in a mad rush forward, defeating it by sheer luck. Antelabbits might also have been from a previous Void Invasion, as some Regalians question the validity of the Elven reports given the manic state they were recorded in and the difficult period the conflict they fought in was. This page was last edited on 12 August 2018, at 09:03.